MIAMI, August 15, 2017 /3BL Media/ – Carnival Corporation & plc (NYSE/LSE: CCL; NYSE: CUK), the world's largest leisure travel company, today released its 2016 sustainability report as part of the launch of its new dedicated sustainability website. 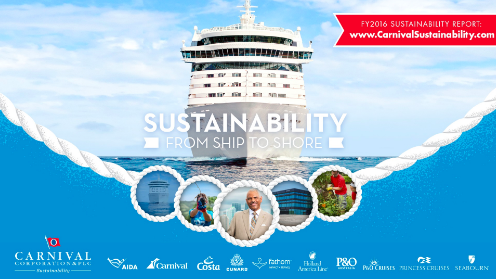 The report and complementary site detail the company’s sustainability efforts and the progress made in 2016 toward its 2020 sustainability performance goals The report was prepared in accordance with the Global Reporting Initiative (GRI) G4 "core" level, and a full copy can be downloaded from Carnival Corporation's new site. Added Burke: “We have a great team of employees, most of whom work and live at sea, and we all understand a healthy environment is not just an operating necessity, but it is also the right thing to do. We want our guests to be confident that when they book a cruise vacation with one of our brands, they are doing so with a responsible global corporate citizen." As part of the site, Carnival Corporation’s president and CEO Arnold Donald invites readers to join the cruise company on its sustainability journey through a welcome video that highlights key elements of the company’s commitment to sustainability. On the new site and report, easy to read messaging – enhanced by colorful graphics, engaging photos and videos – provides updates on progress made during 2016 in sustainability performance. The report was designed to share sustainability practices with stakeholders, including the company's employees, the millions of guests who cruise with Carnival Corporation brands and investors. As the company continued its efforts to achieve a diverse and inclusive workforce and to provide all employees with a positive work environment, Carnival Corporation developed, published and implemented an anti-slavery and human trafficking mission statement to further support human rights efforts in the global communities in which the company’s employees and their families live. Carnival Corporation also revised its corporate Health, Environmental, Security and Security (HESS) and Sustainability policy and initiated the implementation of a diversity council. Received Port of Seattle Green Gateway Awards for Carnival Cruise Line, Holland America Line and Princess Cruises’ commitment to environmental excellence. Inclusion on Savoy Magazine’s Top 100 Most Influential Blacks in Corporate America for Carnival Corporation CEO Arnold Donald and Holland America Line president Orlando Ashford.